Camping in Wales this summer? There's still time left and here are 12 prize picks with spaces on offer! With pitches for campers and glampers alike on a working farm, Dews Lake is a place full of countryside character. Tucked away in sleepy Pembrokeshire, yet still conveniently close to the regions finest sights (including Manorbier Castle and Freshwater East Beach) it's the perfect choice for first time campers. There are no designated pitches and facilities are good, with hot showers, electric hook-up points (for caravans) and handy phone charging stations. Oak Grove Retreats is a site where peace and quiet reigns and a hugely popular spot for tents and caravans alike. It's not hard to see why. Hugged by the verdant Cambrian Mountains, Oak Grove sits just 200 yards across a meadow from the River Wye. The touring field enjoys the best views of this gorgeous waterside scene, while the tent campers are given, not one, but three of their very own separate areas including a 'secret', semi-wild spot. Dreamily named Faerie Thyme has exactly the chill ambience suggested. Space, peace and relaxation are the keys at this adults-only haven and if you're looking for a September spot to escape the last remaining gaggles of school kids you need look no further. Camping pitches are set in an open field or tucked away in the woods, while a pair of retro and daintily painted caravans provide more homely comforts for glampers. 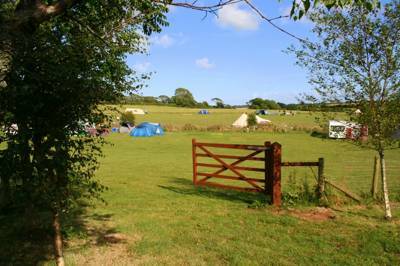 An unassuming little campsite in the shadow of the Preseli Hills, North Lodge consists of unmarked, secluded pitches set between rhododendrons and tall hedges. The welcome is warm and friendly and there’s a genuine laid back feeling to the site. You’ll find it hard to resist the temptation to walk the local footpaths, leading up to summits from which, on a clear day, you can see most of West Wales and even Ireland’s Wicklow Hills on the other side of the sea. High in the hills that border the southern edge of Snowdonia, Eco Retreats offers rustic glamping for those wanting to escape the rush of normal life. Each of the dwellings (four tipis and two yurts) is set in its own idyllic location, with access only on foot. Campfires are encouraged, gadgets are not. To get you in the mood the camping experience includes an individual session of reiki healing in the comfort of your own tipi or yurt and a soothing meditation as the sun sets! On a small, arable farm, with views of the Black Mountains and Brecon Beacons, Wye Glamping offers both an impressive 18ft yurt and 3 bell tents, set alongside the nearby meandering river. Facilities are ample. Both the yurt and bell tents have their own, fully-equipped kitchen hut and, at the entrance of the field, a luxurious wash room features proper flushing loos that show camping can be eco-friendly as well as supremely comfortable. In perhaps the most undiscovered patch of eastern Wales, Powys Pods is a practical alternative to campers seeking more speedy and sturdy night time shelter. The pods come with minimal furnishings – so you still have to bring all you need for a camping trip – but include heating, insulation and ample space. The views are the real highlight here but its winning formula is aided by a superb outdoor kitchen and plenty of activities within easy walking distance. On the slopes of the Aeron Valley and surrounded by mature trees, Aeron View campsite is as attractive to campers as it is the local wildlife. Red Kites are known to nest along the edges – something proven at 4pm each day when the owners come out to feed them! Hard standings are available for caravans but otherwise the grassy spaces are dotted with tents, some with electricity, others, further down the slope, with a more wild and secluded feel. Gwalia Farm ticks few boxes that many consider vital these days but that's precisely what makes it so special. There are no cooking facilities, lights or showers onsite (though you can pay £1 to use one in the neighbouring B&B), but what you do have are a couple of flat fields and a pair of kayaks for use on the medium-sized pond. Life here is simple, distractions are non-existent and within the boundary of Snowdonia National Park it's an incredible place to pitch. Think of Pembrokeshire and you think of the coast. And rightly so, but if you're looking to second guess the bucket and spade brigade who are also heading to the beaches then Gwaun Vale has the ideal location. Tucked back in land, it's possible to walk the footpaths here all day without seeing another human soul. The Preseli Hills make an equally stunning backdrop and the camping pitches are simple, grassy and flat. What more could you ask for? A brand new Cool Camping discovery on the banks of the river Teifi, Henfryn Farm is a tiny organic paradise perfect for a family escape. Just two bell tents – one overlooking the river, another with views across the open hay meadows – ensure an exclusive and personal feel to the place. It's a spot for simple pleasures; there are stones for skimming, animals to pet and a farm shop for reaping the rewards of their sustainable farming methods. Deep in the wilds of the Welsh border, this secluded glamping haven is nestled among vast, mature trees with a giant redwood at its centre. With just two yurts, framed in steam bent wood and effortlessly blended in among the green of the backdrop, the place is quiet, unobtrusive and effortlessly charming. The yurts are accompanied by a well-equipped kitchen lodge and dining area, with trails through the woods, rope swings and stream paddling to keep little ones busy. click here to view more campsites you can book through the cool camping website.